To cook duck bacon, lay slices single-layer in cast-iron skillet, ideally, or on heavy baking sheet lined with parchment paper. Roast in pre-heated oven for about 10-15 minutes, until sizzling, and slightly curled at ends. Drain pieces on paper towels if desired OR, do what I did - drain fat into a little jar, and use it to cook with later! Chop in pieces as tiny as possible. Brush baguette slices lightly with olive oil. On hot grill or under broiler, toast bread until just lightly browned. Mash avocado chunks with zest, juice, and salt until creamy and smooth. 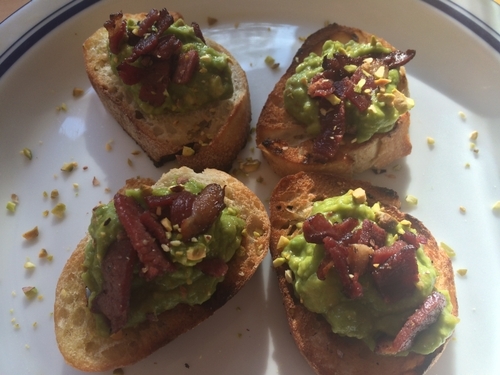 Assemble Avocado Toast by spreading mashed avocado on baguette slices, top with duck bacon dice, and place on serving platter. Sprinkle lightly with crushed pistachios, and finally drizzle very lightly with olive oil to serve. In another life, I was Consulting Chef for what I called the Avocado Board. This agency represented avocado growers from California and Chile, and engaged my chef services for recipe development, events, and food styling for television. I was regularly gifted with cases of just-ripe avocados to play with. This was a charmed life. It was said that spreading avocado on toast was healthier than using butter, so I acted accordingly. More fat seemed irresistible ;-) so I topped it with extra-virgin olive oil and a sprinkle of coarse sea salt. I even submitted that "unique" suggestion to a now-defunct website called Toast.com. Fast forward to this summer, when I learned (surprise, where have I been?) 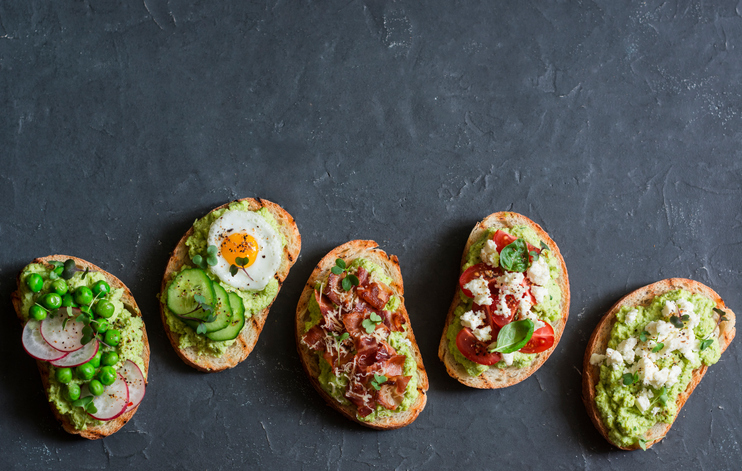 that "Avocado Toast" is quite the trendy appetizer; it starts and sometimes even ends with mashed avocado, extra-virgin olive oil, and coarse sea salt. Seriously? Fine. Wait til you see how I've one-upped my own original, bright idea. It helps to have merchants as really good friends at the Original Farmers Market, LA's best grocery store, where I can't resist shopping after hosting one of our Market tours. Jim Cascone, owner of Huntington Meats and Farmers Market Poultry, highly recommended their duck bacon when it arrived in his (Poultry) case, only a couple months ago. My friends ... I am here to promise you that this $10 will be some of the smartest money you will ever spend, for 8-oz of this cured duck breast. This is something like duck prosciutto, which is way more costly! Duck bacon needs to be cooked, and understand that it doesn't really crisp up or crumble like pork bacon but oh, it is so delicious. Especially paired with citrus-seasoned avocado, crushed pistachios and, a little more extra-virgin olive oil (some things never change). What I did to impress a long-time catering client this summer, was to offer this new, very special rendition of Avocado Toast, see recipe below. Simple and, extraordinary. Now we are all officially on trend ~ such a nice feeling, right?